INSTRUCTIONS: Remove incense sticks from box. Place stick firmly in a suitable and secure heat and flame resistant holder (not provided). Light tip of stick then blow out flame so tip glows. I’ve never actually read the instructions on a box of incense before writing them down here; I can usually figure it out on my own just fine thank you very much. I trust that is the case with those who will read this article too. There are a lot of things we use every day which require no need to consult the manufacturer. And because we take for granted the ease with which it comes to us, we assume others know also and therefore feel no need to explain to them what, how, or why we do what we do. For example: I burn incense because it smells good, so I light up a stick and position it near me for my pleasure. I’ve taken the act of burning incense for granted so long that it never occurred to me to read the instructions or write about it. So why am I bothering to do so now? Because I wonder if that is also the case with prayer. After all, no one needs instructions on how to pray, even atheists in foxholes figure that one out without reading any manual. Yet recently I was led to investigate the instructions in the Bible about prayer and how it relates to incense. For the believer who prays regularly, this article may seem…..well…kind of like the idiot instructions on a box of incense. Yet most of us do question at times whether or not God really hears us or how and if He already knows our needs before we bring them to Him why does He ask us to pray? So, it can be to our benefit to read the instructions in the manual and learn more about the mechanics of prayer to increase our confidence in continuing in it. The essence of prayer is to meet with God. In addressing the topic of prayer, the apostle Paul wrote that he prayed with his mind as well as his spirit (1 Cor 14:14-15). So there is an engagement of both mind and spirit in the act of prayer. The things our minds wrestle with bring us to Him with questions and concerns and in the process He unveils our hearts. The connection to our Creator happens when the intellect is stripped and gives way to the spirit’s prayer. We may leave the prayer closet with unanswered questions but gain the peace of God that surpasses all knowledge (Phil 4:7). A recent experience in prayer reminded me of this and is the inspiration for this article. I know God is not a squirrel…. but…. There are days I look very forward to prayer and there are days when I admit, it’s more out of duty or obligation in a rush to get through the list. Other tasks weigh on my mind. It seems the past few days have had interruptions and distractions keeping me from hearing God’s voice, but I knew today would be quiet so last night I went to bed looking forward to a morning of prayer. I’m blessed to live on the river with beautiful views surrounding my home. Downstairs I have a favorite spot known as “the prayer chair.” It’s positioned near an east facing window making it a perfect spot to receive the morning sun. Upstairs I have an office with another comfortable chair and floor pillows for kneeling, but since it’s on the west side of the house, it’s not as welcoming in the morning. But this morning beckoned me to the tall east facing windows behind my kitchen table. I tossed the pillows on the floor, peered through the pines and absorbed the creation by watching the sun sparkle on the river below. It’s not hard to begin intercessions when He makes it so easy to come in with thanksgiving and praise. As the Spirit opened, I found myself receiving a lesson on the struggle between intellect and love, the mind and the heart. I received a wonderful word on incense which I wrote down for another time. As I prayed for others on my list, He relieved my intellect and gave in its place wordless groans (Romans 8:26). I trusted the Spirit’s prayer more than my own and I let it flow. Then the hunger increased, I asked to know Him more intimately, to know He was near. I asked for a touch, a vision, anything. Just then, I opened my eyes face-to-face with a gray squirrel staring at me through the window. Only a sheet of glass stood between the two feet of space that separated us. I watched him nervously jitter from one end of the window to the other cautiously checking my eyes to see if they followed him. Finally, he was gone, off to gather his provisions. And once again, with humor God reminded me that yes, He was very near. I was allowed this understanding only by remaining still and silent on my knees where I’d be able to meet with Him face-to-face. I didn’t begin my prayers on January 10, 2012 asking to understand incense. I was actually just going through my usual Tuesday morning list. I came in with my mind and it’s petitions toward God and as I was still before Him, my mind gave way to praying in the Spirit. When it did, I heard a question. And a flood of understanding filled me. Whenever this happens, I scramble for a notebook. This is what I managed to capture. The light from heaven comes. We receive the fire and prayers escape our lips. They ascend to heaven in the smoke of sweet incense. Do not release this until you’re lit with the fire from Him. For He is the one delighting in the aroma of your prayer. If I want to delight in the smell of a stick of incense, I must first go to it and light it. Then I may enjoy the fragrance it brings to my nostrils. How pleasant to be assured that what I pray to God has first been given His attention. He walked over to me and lit me. I am praying….. 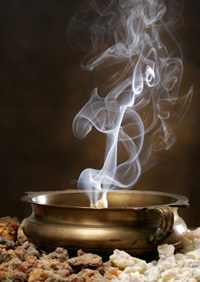 Prayer is like incense. I’d read verses about that before but they never touched my heart as much as they do now. When we pray in Jesus’ name, we are recognizing his role as our High Priest and the right given to us as kings and priests under the new covenant arrangement to participate in intercessory prayer. By the blood of Christ, we enter the holy place. But how is it that we can meet with God who is in the Holy of Holies? The instructions for the altar of incense in Exodus 30 included placing that incense in front of the curtain separating the holy place from the Holy of Holies. The sacred items of the ark of the covenant and mercy seat of God are in the Holy of Holies as described in Exodus 25:10-22. What I found interesting in that account were the cherubim at the two ends of the mercy seat. 17 “You shall make a mercy seat of pure gold, two and a half cubits long and one and a half cubits wide. 18 You shall make two cherubim of gold, make them of hammered work at the two ends of the mercy seat. 19 Make one cherub at one end and one cherub at the other end; you shall make the cherubim of one piece with the mercy seat at its two ends. 20 The cherubim shall have their wings spread upward, covering the mercy seat with their wings and facing one another; the faces of the cherubim are to be turned toward the mercy seat. 21 You shall put the mercy seat on top of the ark, and in the ark you shall put the testimony which I will give to you. 22 There I will meet with you; and from above the mercy seat, from between the two cherubim which are upon the ark of the testimony, I will speak to you about all that I will give you in commandment for the sons of Israel. (Exodus 25:17-22). Cherubim are first mentioned in Genesis 3:22-24 where we learn that their chief role is to guard God’s holiness. Cherubim are also upon the mercy seat of God which is in the Holy of Holies where sin can not enter. What does it mean? Angels are ministering spirits sent out to render service for the sake of those who inherit salvation (Heb 1:14) Angels were sent even to minister to Jesus (Matt 4:11). They continue to play a vital role in our lives bringing us close to God where we can “meet with Him” as we enter the temple. Jacob had a dream in which he saw angels ascending and descending on a ladder set on the earth reaching into heaven. The experience was so powerful that he exclaimed, “surely the LORD is in this place, and I did not know it.” (Gen 28:10-16) He had met with God through the intercession of angels. I like to think of them now coming down the ladder with empty bowls to fill with my prayers. They take them back up to heaven where God mixes His favorite incense with them. But why does God need this mixture of prayer and incense? Aren’t my prayers enough? I found an answer to those questions in a book which is rich with the details of God’s holiness and requirements for fellowship with Him. Sacrificial offerings are the major theme of the book of Leviticus. The grain offering reminded the people of God’s provision of life: daily bread. And they were given instruction as to what kind of bread to offer. Leaven and honey were excluded because they both ferment; however, there was allowance for leavened bread in the offering of firstfruits at Leviticus 23:17. The church, like leavened bread, is composed of sinners. As we begin our prayers, certainly we want to pray in the will of God. But the truth of the matter is, we do not always know if we are. Our sincerity may in fact be tainted with leaven even when we are offering up our petitions and praise in the name of Jesus who is the sinless bread of heaven. Certainly we want our prayers to be pleasing to God, and as sinners we are welcomed to come before the altar even if leaven is present in our prayers, yet can these ascend into the Holy of Holies as the soothing aroma He desires? What can we learn from the shadow set forth in the old covenant? So the question arises; how did God’s people present their grain offerings to become a soothing aroma to the Lord? 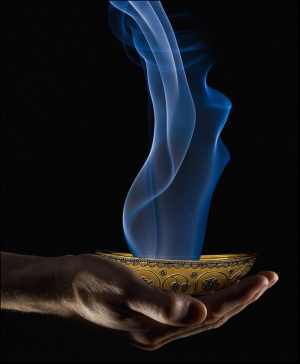 The offering with oil and frankincense became a soothing aroma to the Lord (Lev 2:1-2). Throughout the Bible, oil is associated with the anointing of Holy Spirit and symbolizes the very presence of God (Ps 23:5, Acts 10:38, 1 John 2:20) Perhaps praying in the Spirit could be understood as a “leavened” prayer anointed with oil. It’s interesting to note that when James describes a spiritually sick member of the church, he is not instructed to pray himself but rather to call the elders to pray over him. They anoint the sick one with oil in the name of the Lord (James 5:14-16). When weak, we need the help of oil, or Holy Spirit, to pray. God jealously desires the Spirit which He has made to dwell in us. And so, we are encouraged to pray in the Spirit. Exciting things happen when we wait while praising God. When our prayers are anointed with the oil of Holy Spirit and mixed with the incense of heaven, they become the smoke of the incense that pleases God because what pleases God is that we pray in His will. Though we may enter prayer with our own ideas, God desires His own will to be done and that is why He sends out angels to light the incense and bring our utterances back to Him as holy prayers. So incense is given into the angels censer and once mixed with our prayers, it’s filled with the fire of the altar and thrown to the earth where effects are seen (Rev. 8:3-5)! These become the prayers offered in God’s will. 14 This is the confidence which we have before Him, that, if we ask anything according to His will, He hears us. (1 John 5:14). Heaven is moved whenever or however we pray, but when we stand in the holy place not knowing what to pray or dutifully go through a list, we may miss the intimacy of meeting with God if we’re not still and wait long enough to be “lit,” because it’s the smoke of the incense that reaches past the curtain to please our Father and send angels into action. Prayer is an invitation. God beckons us there to instruct us what He has in store, not the other way around. We have absolutely no idea what God intends to do, how can we know the mind of God? How can our lists of prayers instruct Him what to do? Can we pray without knowing all these details? Of course we can, but I realize now what has been occurring all this time: God enjoys incense, not just prayers. Though He is pleased that I’ve showed up with my first fruits as I start to relate to Him the things on my mind with it’s own words, He says, “she is weak and doesn’t know how to pray about this” and the Spirit begins to intercede. I’ve come in the holy place by the blood of Jesus, I’m positioned before the curtain, He is in the Holy of Holies with cherubim on the seat of mercy. Will He direct their attention toward me? Will “tongues of angels” be given to mix with incense so that my intellect no longer has cause to assert it’s own will over the perfect will of God? Angels descend from heaven with incense and then ascend back to heaven with my prayers and the smoke of this is pleasing to God and I sense my prayers becoming holy enough to go beyond the veil and into the Holy of Holies where I may meet Him there. The intimacy in prayer is as two lovers interlocked in a kiss. Solomon expressed the love between a Shulamite and the king with these words, “Draw me after you and let us run together! The king has brought me into his chambers.” (SS 1:4) When she speaks of his kisses they are described as “the kisses of his mouth.” The most satisfying prayers to God are those uttered in the name of Jesus whose words are planted on our lips. The lovers become one as they run together. The prayer of the perfect Son of God is a fragrant prayer, and it affects those around us even as the king’s scented oil caused the maidens to love him (SS 1:3). Likewise, in relationship to our King Jesus, we take on the fragrance of Christ and are not only pleasing to God but also among those with whom we come into contact (2 Cor 2:15-16-17). 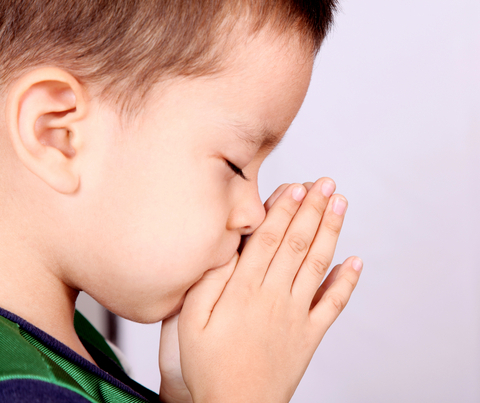 May we never look at our prayers–or a box of incense–as unimportant again. Make it a habit to be still long enough to wait on the incense from heaven to be mixed as a pleasant fragrance to the One who is on the throne. And so beloved, “build yourselves up on your most holy faith, praying in the Holy Spirit,” and of course…. January 23, 2012 Posted by Julie McAllen | According to Scripture, Expressions, Prayer Requests	| angel, apostle paul, Bible, censer, cherubim, devotion, exodus 25, exodus 30, faith, fragrance, God's presence, heaven, holiness, Holy of Holies, holy place, Holy Spirit, incense, inspiration, intercession, intimacy, kisses of his mouth, Leviticus 2, obedience, oil, praise, prayer, revelation 8:3-4, Shulamite, smoke, Solomon, throne, tongues of angels, worship | Comments Off on Who Lights the Incense? These are the attitudes that bind us as we come together in Christ. It is the desire of those who contribute to this journal to help one another: to find encouragement when faced with challenges; to be informed about (prayer) needs of others and be moved to intercept; develop a deep understanding of Scripture; and most of all, strengthen their faith and build intimacy with Christ. Sweet Hour of Prayer: to bless or to curse? God is OH SO Good! Brenda Steere on God is OH SO Good! tk2012 on God is OH SO Good! Linda on God is OH SO Good! Julie McAllen on God is OH SO Good! Marcene on God is OH SO Good!